Thank you for your interest in supporting CEF. We are a faith-based, non-profit ministry that relies on God to supply our financial needs through the prayerful giving of His people. The most spiritually productive harvest field anywhere is among the children. You can give securely using our online processing center below. Enter North Central Indiana to locate our giving site. Choose a fund and a pre-set amount or enter another amount. Select Add to add another fund or move forward to the payment information. Scan or enter your card or bank account information. It only takes a few minutes to create an account with an email address and password. You’ll have the option to log in using the Touch ID/Fingerprint feature or a PIN. You are always welcome to contact us & we will be glad to meet you personally so you can give a love offering! See information below for more details about how to shop and give! See information below for more details about how to contribute through the CAR DONATION PROGRAM! Enter our 10-digit GivePlus Text Number. Then enter the amount you wish to donate and press send. You will be sent a registration link via a text message. Click on the link and enter your contact and payment information. Tap "PROCESS". After your registration is complete, you will receive a verification text as well as a receipt via email. You can even text "REPEAT" to make it a recurring donation! If you are considering supporting CEF on an ongoing basis, or would like to know more about estate planning opportunities please call our office and one of our staff members will be happy to assist you. To make a donation by check or money order, please send your gift payable to: "Child Evangelism Fellowship"
Child Evangelism Fellowship of Indiana, Inc. Please download and print the RESPONSE CARD below to send in your donation through the mail. You can also support our local chapter by shopping online through Goodshop. Goodshop is an online shopping mall that donates a percentage of your purchase price to the cause you want to support. Goodshop partners with 3,000+ stores including top retailers like Amazon (1.5% donation), Staples (2.5% donation), Walmart (2% donation), Family Christian Stores (3.5% donation), and many more. As you shop you also give at no extra cost to you. Click on Goodship Give and search for our cause. Search for "North Central Indiana" and you will find our local chapter Child Evangelism Fellowship® of Indiana - North Central Indiana. Click on our cause and then click "Shop Now". Child Evangelism Fellowship of Indiana, Inc. North Central Indiana partners with DonationLine.com, a Vehicle Donation Charity fundraising agent, that helps individual vehicle donors seeking to support non-profit organizations around the country. Donate your boat, truck, RV, Jet Ski or snowmobile to our organization and receive a tax deduction. This is a no cost, no hassle process which begins when you contact Donation Line LLC. at 1-877-227-7487. Make sure to ask for our extension, #1203 or click here, Donate Your Car Now, and complete the Vehicle Donation Form on line. Make sure to select our organization, Child Evangelism Fellowship® of Indiana, Inc. North Central Indiana, from the drop down list. Select "Child Evangelism Fellowship® of Indiana, Inc. North Central Indiana" as the charitable organization to donate to. Our Local Missionary Director is the one who organizes all of our outreach ministries. The money donated to our Local Missionary Director Support will go to cover the out of pocket expenses of our Local Missionary Director and to help cover their cost of living. This position is a full time position and it is not expedient for our Local Missionary Director to work another job. Your donation will go to meet their physical needs as they meet the spiritual needs of the children and families of our local community. As always, you should prayerfully consider supporting CEF only after your financial obligations to your local church have been fulfilled. Thank you, and God bless you! 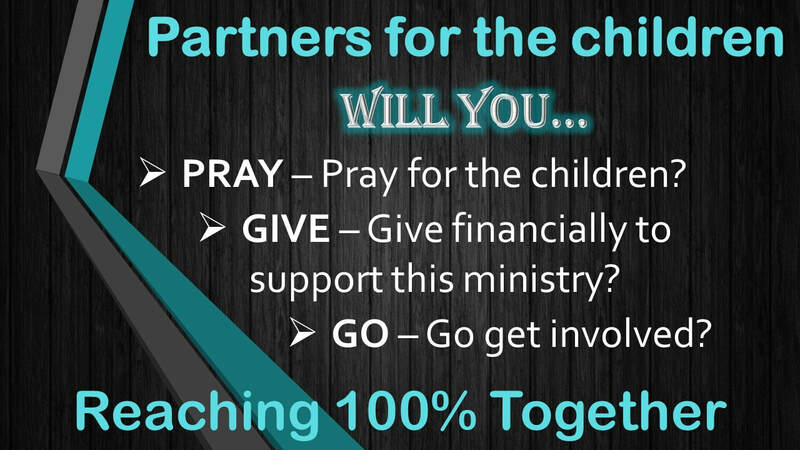 Child Evangelism Fellowship is registered as a 501(c)(3) organization of the USA Internal Revenue Code. A tax deductible receipt is issued promptly for each contribution.